The research team used several approaches to gather data about the megadunes. They took ice and snow samples from snow pits and drilled firn cores. They also installed weather stations to record ongoing weather conditions, and are using satellite data to continue studying the dune areas. During the rest of the year, the researchers analyze samples taken in the field for snow structure and chemistry. This project was a three-year effort that included field work during the first two summer seasons (November 2002 and December 2003-January 2004). The third year will be spent analyzing and compiling the data gathered during the field seasons. See the Research Plan for more details about the team's work. The best way to study "the big picture" of the megadunes is still through satellite and radar imagery. 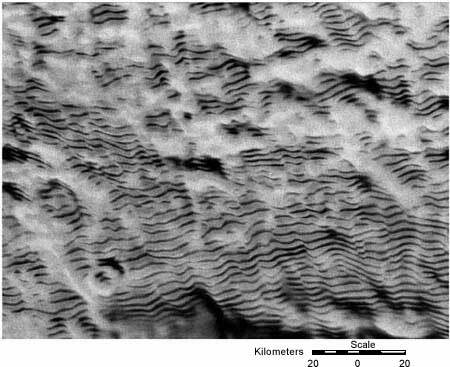 The synthetic aperture radar (SAR) image of the dunes shown below was taken by the Canadian Radarsat satellite. The image looks like a photograph that shows differences in light and shadow. But SAR does not see reflected light, it detects the microwave scattering differences in the grain size of the ice and snow. The brighter surfaces in the image are the upwind sides of the dunes, which contain fine grains of ice. The darker areas are the downwind sides, which contain large, coarse grains just below the surface. For more details on dune formation, see How the Dunes Were Formed. Radarsat image of a portion of the Antarctic megadunes. For more information about the project used to take satellite imagery of the megadunes, see Radarsat Antarctic Mapping Project (RAMP). Measurement of a snow "pipe" with a tape measure. During the first year these "pipes" in the hard-packed snow (known as firn) were an unexpected feature of the megadunes area. The pipes start just beneath the surface and go down into the firn. One deep pipe, like the one shown here, was at least 6 feet 2 inches (1.9 meters) long. The pipes appear to be cracks that form near the surface of the ice and then freeze over.